With an initial capital of just P150,000 in 2008, Kebabers has aggressively grown into a chain of several branches. 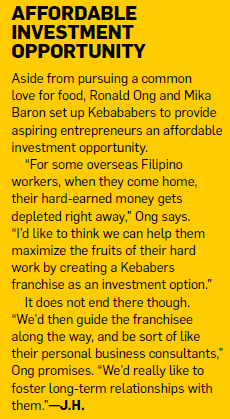 Ronald Mikhail Ong, 29, an export management graduate of the College of St. Benilde, and Mika Baron, 27, who finished European studies at the Ateneo de Manila University, put up Kebabers in November 2008. The enterprise—you guessed it right—is in the business of serving kebabs. Their love for this Middle Eastern meat dish, along with exposure to Baron’s family business, Manila Catering, spurred the idea of setting up a fast-food joint selling kebabs at friendly prices. “Affordable fast food options usually revolve around siomai, burgers, or pizza, but not kebabs, and I think that’s what sets us apart,” Baron says. Kebabers stalls sell meals for less than P60, while restaurants typically charge P100 to P150 for the same meal. With an initial investment of P150,000 and Manila Catering serving as their commissary, the two set up their first Kebabers food cart space at the St. Luke’s Hospital compound in Quezon City in November 2008. After only four months, they recovered their investment, and this encouraged them to take the business further, step away from their family businesses, and focus their efforts full-time on Kebabers. For Kebaber’s owners, starting a business from scratch, especially at their young age, meant learning from mistakes first-hand. They have had to deal with employee theft and unprofitable locations, but they’ve taken these as opportunities to improve their systems. “The decisions you make impact those who rely on the business—your employees—so you really just have to pick yourself back up when you fall,” says Baron. Ong and Baron now have seven Kebabers branches, 16 employees, and are exploring putting up a full-service restaurant.